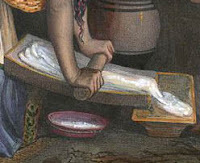 Corn was processed in lye and water, and then the hominy was mashed/ground with a pestle. Corn meal was introduced but rejected by the natives "and the women stoutly declare it impossible to make tortillas in any other than by the ancient method." "The women now proceeded with their occupation of making tortillas, and an interesting occupation it is. 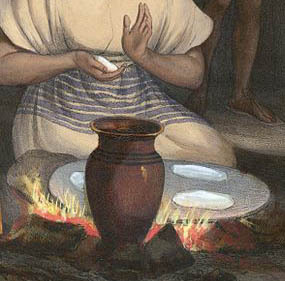 The corn is mixed with a quantity of ley, and boiled for a few minutes over a slow fire. It is then washed, and placed in a pile upon a hollow stone, resembling a small, old-fashioned stool. The corn heaped up at one end has the consistency of boiled hominy. A handful is scraped into the hollow part of the machine, and mashed with a sort of pestle, also of stone. The operation of grinding is somewhat like that of rolling out pie-crust." "The paste is next spatted into the proper thinness, and baked quickly on a piece of sheet iron or stone." "When hot they are very palatable, and in traveling through the country I invariably preferred them to the wheaten bread, which is always ill-made and heavy. The tortilla ("pan del pais''') is found upon every table, among all classes, and constitutes, with frijoles, the principal food of the poor throughout Central America." "The slow process of grinding the corn practiced by the women has led several foreigners to introduce Indian corn-meal, particularly in haciendas at harvest-time, where the laborers are obliged to await the tardy movements of las tortilleras. But, either from prejudice or unwillingness to deviate from established customs, the meal has been every where discarded, and the women stoutly declare it impossible to make tortillas in any other than by the ancient method."